On 13 and 14 June the Islamic Reporting Initiative (IRI) took part in a summit in Malta to address modern-day slavery. 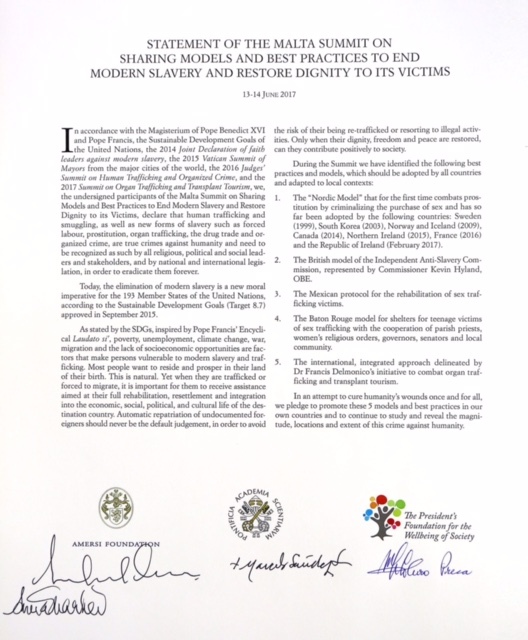 The summit, entitled ‘Sharing models and best practices to end modern slavery and restore dignity to its victims’, was organised by the Amersi Foundation, in cooperation with the Pontifical Academy of Sciences, and the Maltese President’s Foundation for the Wellbeing of Society. Moderated by Mohamed Amersi, Chairman of the Amersi Foundation and Chairman of the Board of Trustees of the IRI, it was held at the Verdala Palace and the San Anton Palace in Malta. In her opening speech, H.E. Marie-Louise Coleiro Preca, President of Malta, explained that modern-day slavery is one of the greatest human rights contraventions of today’s world and that it must be urgently addressed on a global scale. Some 11% of the world’s children are estimated to be affected, with approximately 85 million being engaged in hazardous work. Although sub-Saharan Africa has particularly high rates of child slavery, there is evidence indicating that children in many other regions, including the EU and the rest of Europe, are also victims. In Libya human trafficking and smuggling is endemic and a Reuters report of April 2017 stated that ‘trade in illegal organs is a booming business in Lebanon.’ The UK Centre for Social Justice released a report endorsed by the European Commission entitled ‘A Modern Response to Modern Slavery’ which stated that much of contemporary European slavery is driven by organised crime. The Maltese President also said that the underlying roots of modern-day slavery often lay in extreme poverty and vulnerability. ‘Making modern slavery a thing of the past will require a fight against organised crime, but we must also fight the root causes, of poverty and precarity, which make a person vulnerable to exploitation in the first place,’ she stated. Several of the United Nations’ Sustainable Development Goals refer specifically to the eradication of poverty and the necessity to ‘secure the prohibition and elimination of the worst forms of child labour, including recruitment and use of child soldiers, and by 2025 end child labour in all its forms.’ A number of initiatives have been set up to this end, including one by the United Nations University in collaboration with the United Kingdom’s Modern Slavery Innovation Fund and the International Labour Organisation. At the summit it was agreed that a wide approach to addressing modern-day slavery was required, stretching right across authorities, the private sector, supply chains and industries. The President concluded that it was essential for interdisciplinary strategies to be developed to address the challenge, for the benefit of present and future generations. Photo: Signing of the joint declaration of Religious Leaders​ against Modern Slavery. F.l.t.r. Bishop Marcelo Sánchez Sorondo, Chancellor of the Pontifical Academies of Sciences and Social Sciences, Her Excellency Marie-Louise Coleiro Preca, President of Malta and current President of the EU Commission, and Mohamed Amersi, Founder of The Amersi Foundation and Chairman of the Board of Trustees, Islamic Reporting Initiative. How can we stop islamophobia together?